The ETH ACM ICPC Local Contest will take place on October 27, 2012. The competition lasts for 5 hours and consists of 5 to 10 problems. 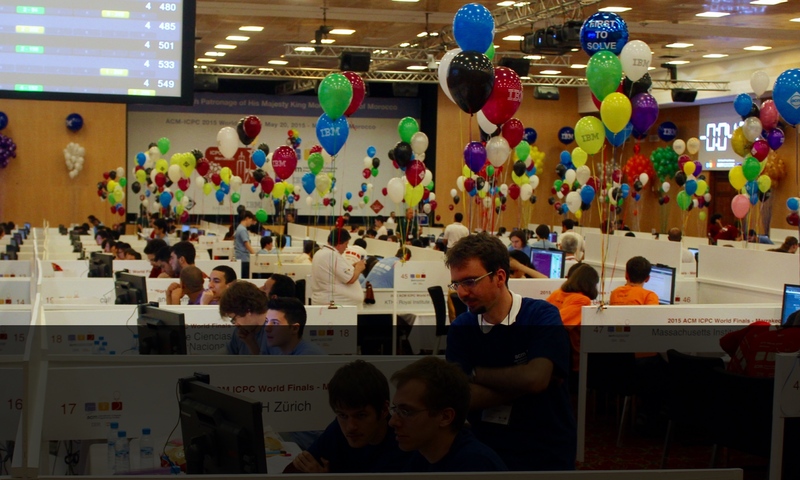 The allowed programming languages are the same as in official ICPC competitions — C, C++ and Java. Two teams are formed from the best six participants who are enrolled at ETH and meet the Regional Contest eligibility requirements. Those teams will represent ETH at the Regional Contest in Valencia. As in last year, we are glad to hold the contest together with EPFL in Lausanne (PolyProg). 9:00 Meeting in the VIS Bureau (CAB E 31), breakfast, late registration. 9:45 Briefing, last questions, seat allocation. 10:00 Contest starts (CAB H56/H57). Please register for the contest here: http://hc2.ch/swerc/. Apart from the Local Contest we will host a short welcoming contest with a bit easier tasks on October 13 and another full-length training contest on October 20. Both will take place in CAB H56/H57 (the computer rooms). 13:00 Meeting in the VIS Bureau (CAB E 31), late registration, introduction to the judging system. 13:45 Briefing, last questions, seat allocation. 14:00 Contest starts (CAB H56/H57). 9:00 Meeting in the VIS Bureau (CAB E 31), small breakfast, late registration. Please register for the welcome and training contests here: http://hc2.ch/swerc/. You may also just show up and register a few minutes before the start of the contest. Rules: The local contest is a “closed-book” competition. No materials are allowed, i.e., no books, cheat cheats, Internet etc. The language references for C, C++ and Java will be available. For the detailed rules, consult ”Contest Rules”. You may also wish to take a look at the team manual for the judging system. Lastly, note that you need access to the CAB Building. All CS students should be able to access the building with their Legis. If you are not a CS student and cannot access the building, please contact us at acm_at_vis_dot_ethz_dot_ch, so that we can open the door.